Jessica & Justin’s Wedding at The Joule! When Tanya and Cesar Perez of Perez Weddings sent us these images from Jessica and Justin’s wedding, we couldn’t stop oo’ing and aah’ing! Jessica and Justin’s wedding at The Joule was stunning, and Cesar and Tanya captured the details and emotions of their day so well. 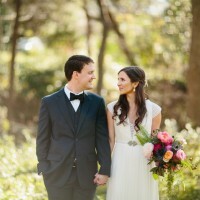 Jessica was a pure joy to work with, and we were so honored to be a part of their big day. This couple truly knew how to relax and enjoy their day while letting us worry about the details – love it! Special shout-out to Debby and Amanda at Branching Out Events for designing amazing décor for the day! As always, they created incredible floral designs that were truly pieces of art! And, the team at The Joule was SO amazing to work with…some of the best service we’ve ever seen! Congrats to Jessica and Justin! We loved working with you! Peacock feathers. I love it! Particularly the one in the groom's lapel. LOVE the Joule! Such an amazing hotel and venue. What a lovely event!